The industry-leading AWG7000 Series arbitrary waveform generators (AWG) represent a cutting edge benchmark in performance, sample rate, signal fidelity, and timing resolution. With up to 24 GS/s and 10-bit vertical resolution, the AWG7000 Series of AWGs delivers the industry's best signal stimulus solution for ever-increasing measurement challenges. This allows for easy generation of very complex signals, including complete control over signal characteristics. Vertical resolution up to 10 bit available. The Dynamic Jump capability enables the creation of complex waveforms by enabling the ability to dynamically jump to any predefined index in a waveform sequence. Users can define up to 256 distinct jump indexes that respond to changing external environments. Using the LXI Web Interface, you can connect to the AWG7000 Series through a standard web browser by simply entering the AWG's IP address in the address bar of the browser. The web interface enables viewing of instrument status and configuration, as well as status and modification of network settings. All web interaction conforms to the LXI Class C specification. Creating RF signals is becoming more and more complex, making it more difficult for RF engineers to accurately create the signals required for conformance and margin testing. When combined with RFXpress, the AWG7000 Series can address these tough design challenges. 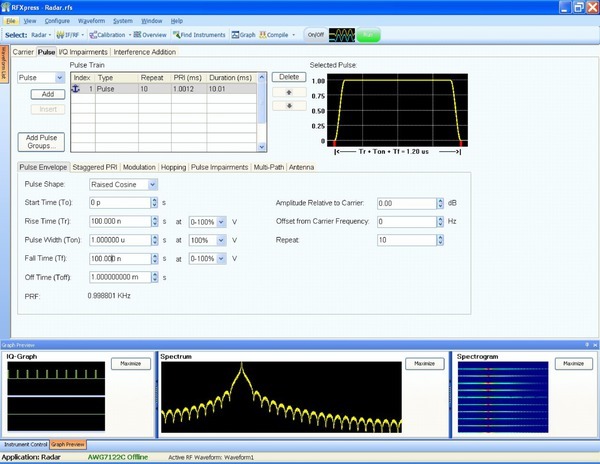 RFXpress is a software package that digitally synthesizes modulated baseband, IF, and RF signals taking signal generation to new levels by fully exploiting the wideband signal generation capabilities of the AWG7000 Series arbitrary waveform generators (AWGs). Together the AWG7000 and RFXpress provide engineers with "bandwidth on demand", which is the ability to generate wideband modulated signals up to 5.3 GHz (-3 dB) anywhere within the 9.6 GHz frequency range. The latest digital RF technologies often exceed the capabilities of other test instruments because of the need to generate the wide-bandwidth and fast-changing signals that are increasingly seen in many RF applications such as radar, RF comms, OFDM, and UWB. 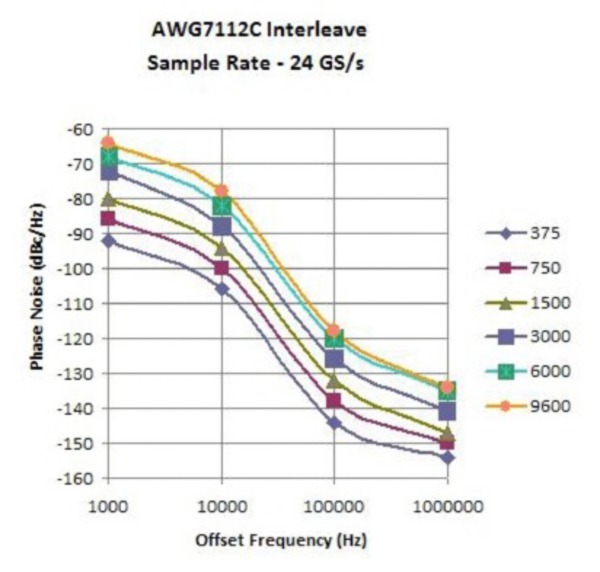 When used in conjunction with RFXpress the AWG7000 Series supports a wide range of modulation formats and simplifies the task of creating complex RF waveforms. 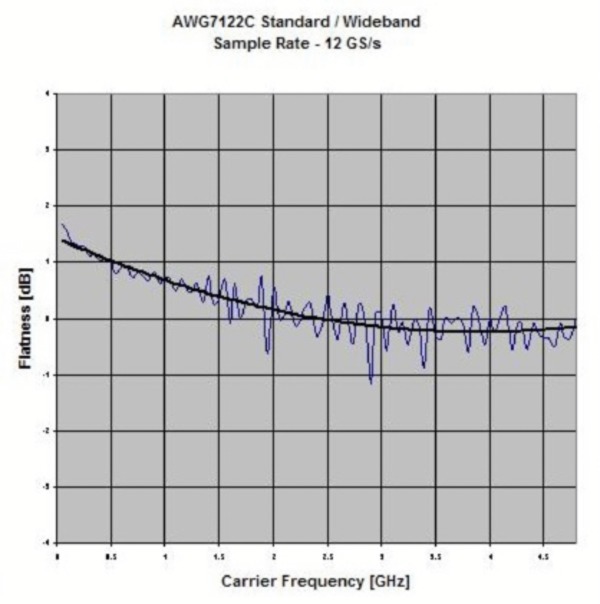 The AWG7000 Series instruments provide customers with ways to generate fully modulated baseband, intermediate frequency (IF) signals, or directly generated RF waveforms. Generating advanced radar signals often demands exceptional performance from an AWG in terms of sample rate, analog bandwidth, and memory. The Tektronix AWG7000 Series sets a new industry standard for advanced radar signal generation, by delivering wide modulation bandwidths up to 5.3 GHz (-3 dB). 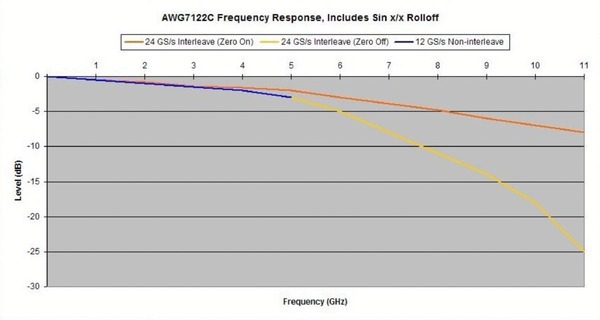 With a sample rate of up to 24 GS/s the AWG7000 Series can directly generate RF signals never before possible from an AWG. In instances where IQ generation is desired, the AWG7000 offers the ability to oversample the signal, thereby improving signal quality. The AWG7000 and RFXpress are the perfect solution for creating complex radar signals. Customers are provided with the ultimate flexibility in creating custom radar pulse suites. Modulation types such as LFM,Barker and Polyphase Codes, Step FM, and Nonlinear FM are easily created using the AWG, and the flexibility of RFXpress enables the creation of waveforms requiring customer-defined modulation types. The AWG and RFXpress combo also has the ability to generate pulse trains with staggered PRI to resolve range and doppler ambiguity, frequency hopping for Electronic Counter-Counter Measures (ECCM), and pulse-to-pulse amplitude variation to simulate Swerling target models including antenna scan patterns, clutter, and multipath effects. AWG radar pulses created with AWG7000 and RFXpress. Radar signals must coexist with other commercial standard signals sharing the same spectrum and are still expected to perform with no performance degradation. This isn't unreasonable given its mission-critical operations. To meet this expectation, a radar designer has to thoroughly test all the corner cases at the design/debug stage. The AWG7000 and RFXpress Environment plug-in offers extreme flexibility to define and create these worst-case scenarios. You can specify up to 25 signals to define your environment, including WiMAX, WiFi, GSM, GSM-EDGE, EGPRS 2A, EGPRS2B, CDMA, W-CDMA, DVB-T, Noise, and CW Radar. This plug-in also allows you to seamlessly import signals from other RFXpress plug-ins (including Radar, Generic Signal, etc. ), as well as from Matlab® and from Tektronix spectrum analyzers and oscilloscopes, into your environment. You can also configure PHY parameters of your standard-specific signals. You can define the carrier frequency, power, start time, and duration for all the signals in your environment, so you have full control over the way these signals interact/interfere with each other. In today's wireless world, OFDM is becoming the modulation method of choice for transmitting large amounts of digital data over short and medium distances. The need for wide bandwidths and multiple carriers create challenges for engineers who need to create OFDM signals to test their RF receivers. The AWG7000 Series, when coupled with RFXpress, allows users to configure every part of the OFDM signal definition. Engineers can build signals symbol-by-symbol to create a complete OFDM frame or let the RFXpress software choose default values for some signal aspects. The AWG/RFXpress combo supports a variety of data coding formats that include Reed Solomon, Convolution, and Scrambling. Users also have the ability to define each subcarrier in the symbol which can be configured independently for type, modulation, and base data. 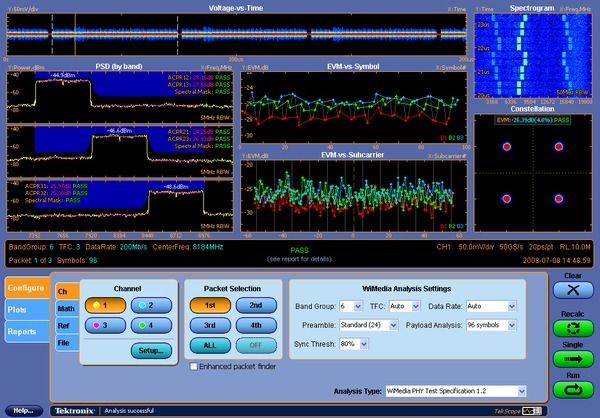 The RFXpress software gives visibility into all aspects of the OFDM signal by providing a symbol table that gives a summary of all the carriers in the selected symbol. OFDM packets/frames can be built by specifying the spacing between the symbols/frames and parts of the OFDM packets can be stressed by adding gated noise. Ultra-Wideband (UWB) wireless is a growing technology that is designed for low-power, short-range wireless applications. UWB has emerged as the leading technology for applications like wireless Universal Serial Bus (USB). UWB radios, like generic OFDM radios, require wide signal bandwidths and multiple carriers, but UWB designs also require short-duration pulses and transmit Power Spectral Densities (PSDs) near the thermal noise floor which can make creating UWB test signals very difficult. Fortunately, the AWG7000 Series and RFXpress offer a solid solution for the generation of UWB test signals. The AWG7000 and RFXpress have the capability to digitally synthesize and generate signals in the UWB spectrum. For either custom UWB signal or ones defined for the latest WiMedia specification, the AWG7000 solution can recreate signals that are required to band hop in real time over a 1.6 GHz modulation bandwidth. The RFXpress software gives users complete control over the characteristics of their UWB signals including the preamble synchronization sequences, cover sequences, and TFCs. For WiMedia applications all six band groups (BG1 to BG6) can be generated in either IQ, IF, or direct RF signals, giving users 3 different options for creating/up-converting the signals when using an AWG7000 instrument. Direct WiMedia signals are easily created with the AWG7000 and RFXpress. Serial signals are made up entirely of simple ones and zeros - binary data. Historically engineers have used data generators to create digital signals. As clock rates have increased these simple ones and zeros have begun to look more like analog waveforms because embedded in the digital data are analog events. The zero rise time and the perfectly flat tops of textbook digital signals no longer represent reality. Electronic environments have noise, jitter, crosstalk, distributed reactances, power supply variations, and other shortcomings. Each takes its toll on the signal. A real-world digital "square wave" rarely resembles its theoretical counterpart. Since the AWG7000 Series is an analog waveform source it is the perfect single-box solution that is used to create digital data streams and mimic the analog imperfections that occur in real-world environments. The AWG7000 Series uses direct synthesis techniques which allow engineers to create signals that embody the effects of propagation through a transmission line. Rise times, pulse shapes, delays, and aberrations can all be controlled with the AWG7000 Series instruments. When used in conjunction with the SerialXpress software package, engineers are provided control over every aspect of their digital signals reaching speeds of up to 6 Gb/s. This is exactly what is needed for rigorous receiver testing requirements. 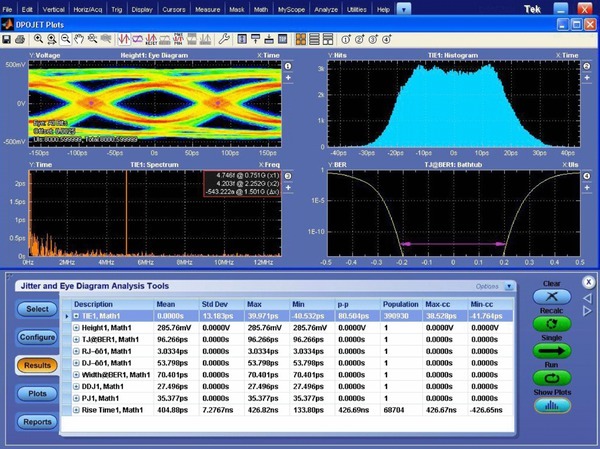 SerialXpress is an integrated SW tool that enables AWG7000 Series instruments to create a variety of digital data impairments such as jitter (Random, Periodic, Sinusoidal), noise, pre/de-emphasis, duty cycle distortion, Inter-symbol Interference (ISI), Duty Cycle Distortion (DCD), and Spread Spectrum Clocking (SSC). The transmission environments of both board and cables can be emulated using touchstone files uploaded into SerialXpress. The AWG7000 and SerialXpress solution also provides base pattern waveforms for many of today's high-speed serial applications such as SATA, Display Port, SAS, PCI-E, USB, and Fibre Channel. Easily create digital data impairments with the AWG7000 and SerialXpress. For high-speed serial applications the AWG7000 Series offers the industry's best solution for addressing challenging signal stimulus issues faced by digital designers who need to verify, characterize, and debug complex digital designs. The file-based architecture uses direct synthesis to create complex data streams and provides users with the simplicity, repeatability, and flexibility required to solve the toughest signal generation challenges in high-speed serial communication applications. 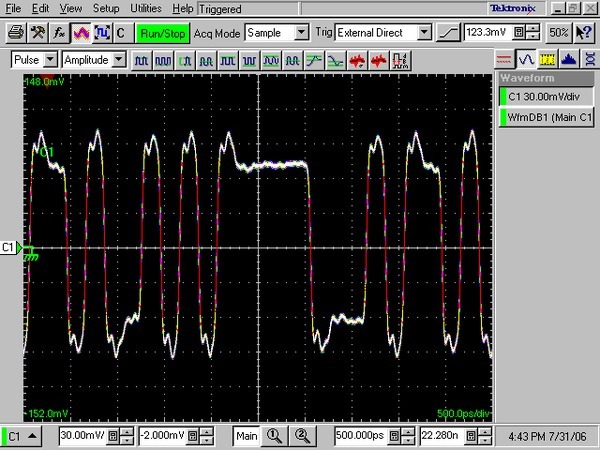 Digital data with de-emphasis added using the AWG7000 and SerialXpress. Minimum frequency switching time from selected waveforms in sequence mode is determined as "1/Fmaximum"
Modulation bandwidth is defined as the lower of the sin(x)/x bandwidth or the calculated percentage of rise time bandwidth (as shown). 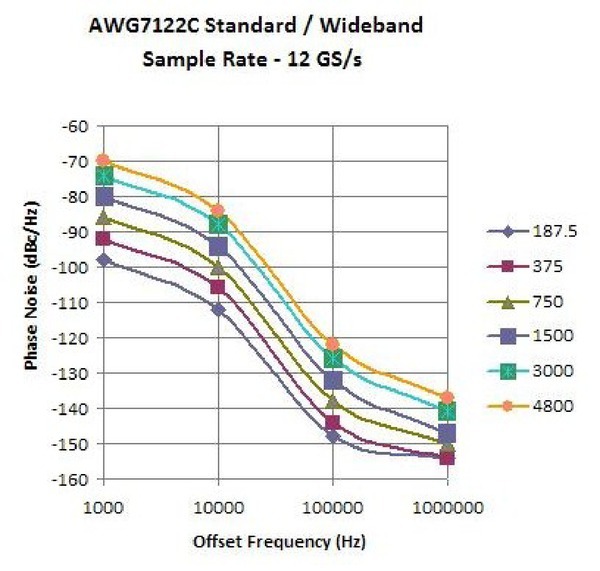 AWG7122C Standard/Wideband Phase Noise (typical). 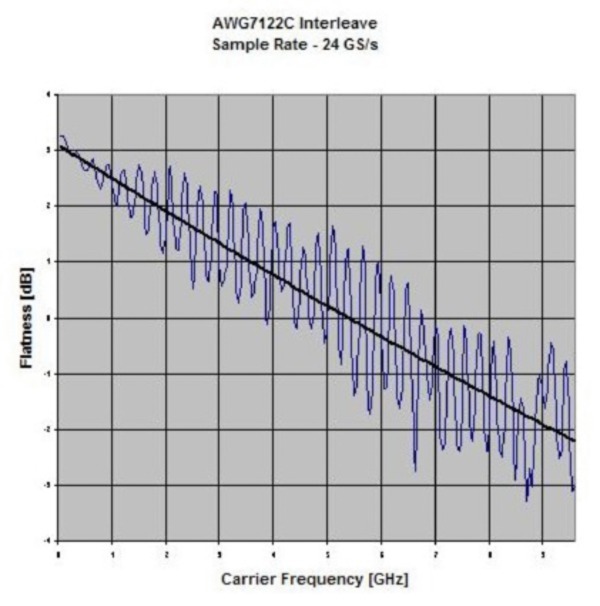 AWG7122C Interleave Phase Noise (typical).